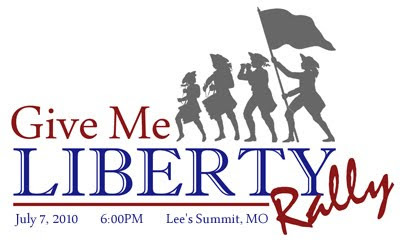 Visit this site to register for Missouri Lincoln Days. Lincoln Days is one of Missouri’s largest gatherings of Republican activists and elected officials from across the state, featuring nationally-recognized speakers, live entertainment, and grassroots training. 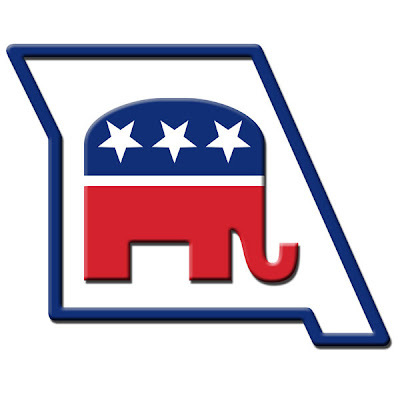 Join your fellow Missouri Republicans as we celebrate our 2010 success and look towards the 2012 election! 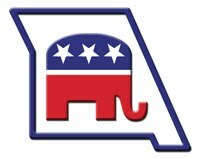 We are pleased to announce that the Missouri Republican Party, in conjunction with the Missouri Association of Republicans, will be hosting our annual 2011 statewide Lincoln Days in February in Springfield, Missouri-the heart of conservative Southwest Missouri and home of Senator-elect Roy Blunt. The event, which is now in its 112th year, will bring together hundreds of Republican activists and elected officials from across Missouri. This year, the gathering will serve as a huge 'thank you' to you, our most devoted volunteers and conservative grassroots activists, for your hard work during the recent election. 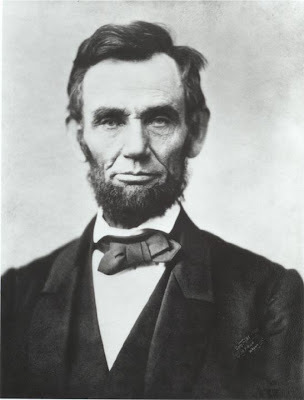 Lincoln Days will also be the unofficial start to the 2012 campaign season-a critical election that will see races for 5 of Missouri's statewide constitutional positions, a race for U.S. Senate, and of course, a campaign for president. Over the years, Missouri's Lincoln Days celebration has attracted some of the biggest names in national politics, and this year will be no different. 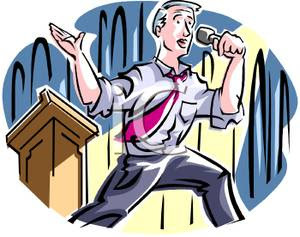 We are currently working to put together an exciting program of dynamic speakers and events-so please stay tuned for details. Registration will open in the coming weeks, and we will provide you with this information as soon as it is available. Until then, please save the date for what will surely be an great event! We look forward to seeing you in Springfield in February! America, an amazing and exceptional country, is grounded in principles and ideas, but these ideas are under seige. From the very beginning of our nation, faith and freedom were deeply intertwined. Liberty strengthened faith, allowing it to freely express its beliefs; pursue its divine mission. But faith was necessary for liberty – not only does it shape moral character; it builds the moral fiber necessary for us to be free." To read the entire script of this video, click here. Patriotic song,God Bless America, an immediate hit and has been ever since. Sung by Kate Smith as she introduces this song for the first time to America on Nov. 11, 1938. She sang Irving Berlin's prayerful "God Bless America" for the first time on her radio show in 1938 and it became an overnight sensation, and is still sung to this day. Note: Be sure to watch the entire video because at 4.21 there is a cameo performance by, yes, it really is-- Ronald Reagan. 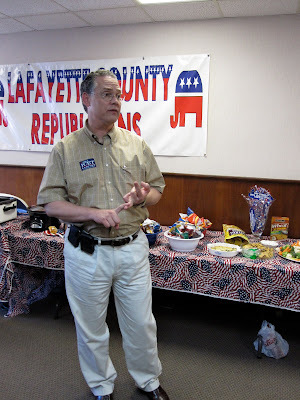 MoGOP chairman: "Historic victories will be remembered for generations to come"
“Across the nation and throughout Missouri, millions of Americans stood up for freedom and against Barack Obama’s big government policies. In race after race and state after state, overwhelming Republican victories serve as both a repudiation of the Democrats failed agenda and a call to return to responsible, common-sense solutions that will create jobs, jumpstart the economy, and rein in a national debt that is threatening our future. “The Missouri GOP would like to congratulate our Republican candidates at all levels of government for their hard-fought campaigns and thank them for their desire to serve their fellow Missourians—especially Senator-elect Roy Blunt, Congresswoman-elect Vicky Hartzler, Auditor-elect Tom Schweich, Congressman-elect Billy Long, and the new and returning GOP members of the Missouri General Assembly. “Their historic victories will be remembered for generations to come..."
Are independents a de facto third party in America? Is there a political home for socially liberal, fiscally conservative voters? Yaron Brook and Terry Jones speak with Allen Barton about what independent voters were telling public servants in the 2010 elections. Could we see the final backlash against government intrusion in private lives and the private sector? Find out. It's not just the message; it's the messenger--"Americans Vote for Maturity" and sorely miss Ronald Reagan's fully mature, fully seasoned self. "...'The people have spoken, the bastards." That would be how Democrats in the White House and on Capitol Hill are feeling. The last two years of their leadership have been rebuffed. The question for the Democratic Party: Was it worth it? Was it worth following the president and the speaker in their mad pursuit of liberal legislation that the country would not, could not, like? And what will you do now? Which path will you take? The Republicans saw their own establishment firmly, sharply put down. The question for them: What will you do to show yourselves worthy of the bounty? The Republicans won big, but both parties return to Washington chastened. Good..."
"...The point is that Reagan's career is a guide, not only for the tea party but for all in politics. He brought his fully mature, fully seasoned self into politics with him. He wasn't in search of a life when he ran for office, and he wasn't in search of fame; he'd already lived a life, he was already well known, he'd accomplished things in the world. Here is an old tradition badly in need of return: You have to earn your way into politics. 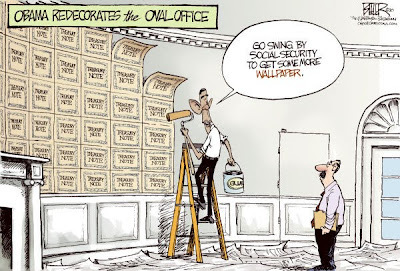 You should go have a life, build a string of accomplishments, then enter public service. And you need actual talent: You have to be able to bring people in and along. You can't just bully them, you can't just assert and taunt, you have to be able to persuade. Americans don't want, as their representatives, people who seem empty or crazy. They'll vote no on that. It's not just the message, it's the messenger." 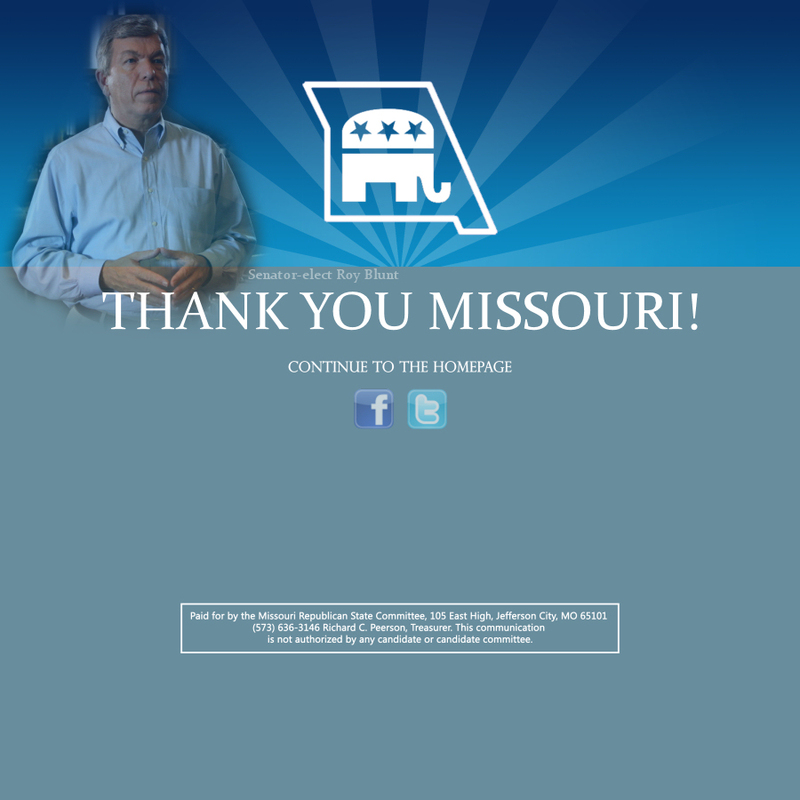 THANK YOU MISSOURI AND THANK YOU LAFAYETTE COUNTY! ELECTION NIGHT RESULTS IN LAFAYETTE COUNTY: A huge victory here and statewide! County website with official election results. 1. Harold Hoflander won the Presiding Commissioner race with 59.41% to 40.46% of the vote, winning all 15 of 15 precincts. 2. Rep. Mike McGhee won his last term (term-limited out in 2012) with his biggest margin ever--66.9% to 33.1% of the vote. 3. Roy Blunt won the U.S. Senate seat big in Lafayette County, bigger than he did statewide, with 59.5% of the vote here versus Carnahan's 35.2%. 4. Vicky Hartzler beat Ike Skelton in the 4th CD with 50.4% to 45.1% of the vote. In Lafayette County, she lost the county and received 4939 to Skelton's 6567. Ray, Lafayette, Saline, Johnson, Henry, Moniteau, Hickory and Pulaski were the only counties of the 25 in the 4th CD that Skelton carried. 5. Tom Schweick for Auditor won in Lafayette County 54.99% to 41.38%. 7. Rep. Stanley Cox, Republican (118th Legislative District) won with 70.37%.. Part of his district is in Lafayette County, the rest in Pettis. 8. Sheila Solon, Republican (55th District) won with 75% of the vote. There were only 36 votes in this district from Lafayette County, a small portion of the district. 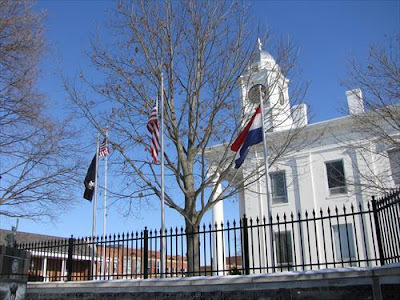 The 55th Missouri House District includes portions of Blue Springs south of Interstate 70 and most of Grain Valley and Oak Grove as well as portions of unincorporated Jackson County and a small part of Lafayette County. 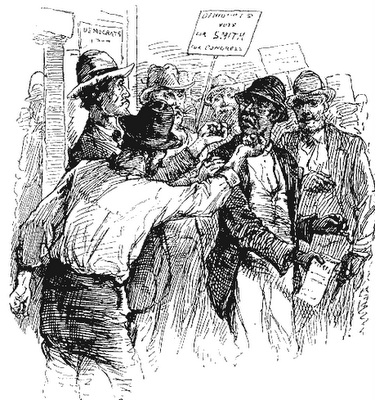 Vote Nov. 2nd because as Mark Twain once said: "Vote: the only commodity that is peddleable without a license..."
This ink drawing appeared in the first edition of "Life on the Mississippi". "But in this country we have one great privilege which they don't have in other countries. When a thing gets to be absolutely unbearable the people can rise up and throw it off. 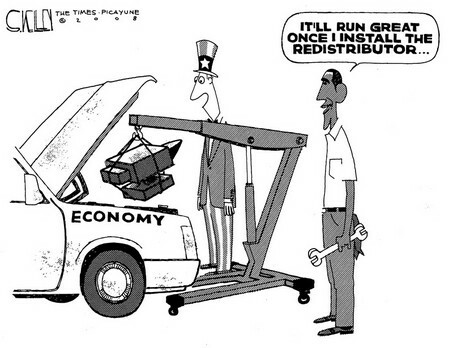 That's the finest asset we've got--the ballot box." Ready to vote? Polls show Republican voters are super-extra-with-sugar-on-top excited to cast their protest votes! The Enthusiasm Gap: "Simply put, polls show Republican voters are super-extra-with-sugar-on-top excited to cast their protest votes against President Obama and his socialist cronies this November while Democrats are -- to put it mildly -- a lot less jazzed about casting a vote for the team currently in charge." 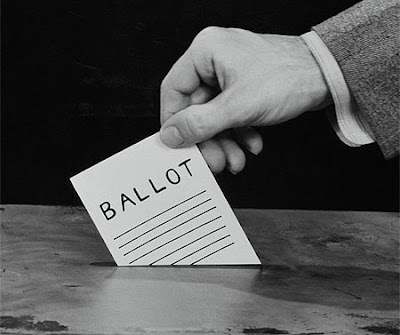 Click here for the official ballot language of the 2010 Ballot Measures certified for the Nov. 2 General Election. And in the race for the 4th Congressional District, look what 4th CD voters have to say in: "Time for a Change", a video by MoGOP. Come rain or come shine, don't forget to vote on November 2nd! Video: Elections have consequences--On November 2, VOTE! 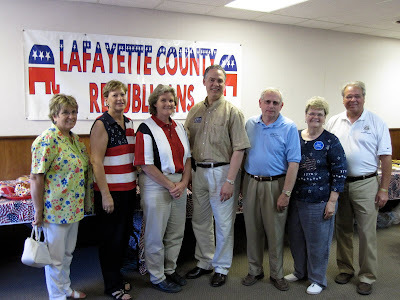 Harold Hoflander, a resident of Lafayette County for nearly thirty years, is the Republican candidate for the open seat of Lafayette County Presiding Commissioner. Lafayette County is changing daily as its close proximity to Kansas City brings new and challenging issues to our doorstep each year. Currently, we are facing difficult financial times at every level of government. Going forward, we need a county presiding commissioner who can help us navigate what could be trying economic situations ahead. Hoflander brings to the job a wealth of business know-how and leadership experience that is vital to the successful management of a county the size of ours. We need a Presiding Commissioner who has rock-solid analytical skills, both financial and operational, with a strong and working understanding at an economic and financial level. 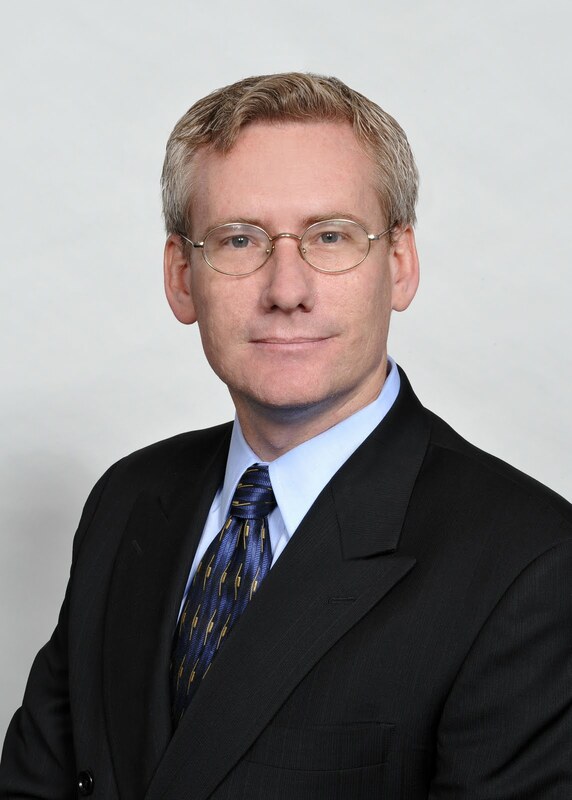 Harold Hoflander is a good fit for the job of Presiding Commissioner, and we hope you will join the Central Committee in working hard to elect him to this position. 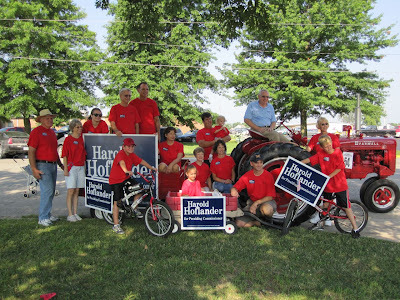 Hoflander has owned and operated the Ford dealership in Higginsville since 1982. He is active in numerous community, civic, and service organizations including serving for many years as a board member of the Higginsville Development Board and the Higginsville Chamber of Commerce. He is also a past-president and current board member of Main Street Higginsville, Inc., a non-profit economic development organization. Hoflander is a Paul Harris Fellow of the Higginsville Rotary Club and a member of Salem United Church of Christ. 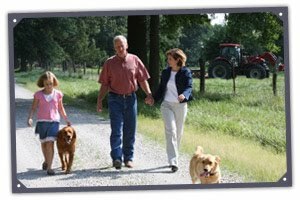 Hoflander is also a member of the Missouri Farm Bureau and continues to operate his family farm, a Missouri Century Farm, in Cooper County. 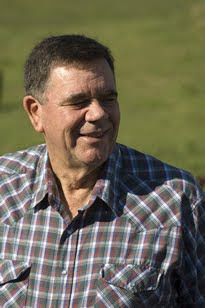 He also farms a small acreage in Lafayette County. 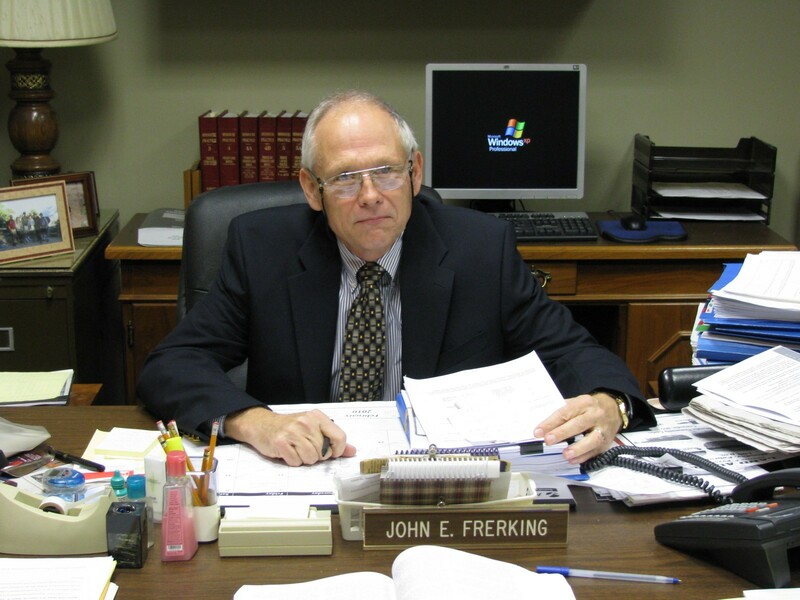 The Honorable Judge Frerking began his judicial career on Jan. 1, 1987, and has served six terms. He holds a Juris Doctorate from the UMKC School of Law and a B.S. in Business Management from the University of Central Missouri-Warrensburg. Frerking is a graduate of Santa Fe High School in Alma and a United States Army veteran as well as a member of the Immanuel Lutheran Church of Higginville, Higginsville Rotary, and the American Legion. Prior to serving as Associate Circuit Judge, Frerking was a trust officer for First National Bank of Kansas City and was in private law practice with the firm of Green & Frerking in Higginsville. He and his wife, Valerie, have two children, Chris and Matt. 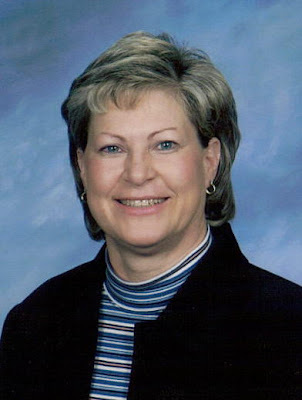 In 1991, Cherie began working for Lafayette County as a Deputy Auditor in the Auditor’s office. She was first elected as Lafayette County Auditor in 1994 and began serving the citizens of the county with her first term in 1995. Cherie is currently running for her 5th term as Lafayette County Auditor. Cherie currently serves as President of the Missouri Association of County Auditors and in June will become President of Alpha Epsilon Beta Sorority in Lexington. She is Co-Chair of the Lafayette County Courthouse team that helps raise funds for the Lafayette County Relay for Life Cancer Walk. She is also a member of the First Baptist Church of Lexington. She & her husband Dean, who works for ATK-Lake City, lives in Lexington. They have four children, Jeremy, Travis, Chad & Melissa. They also have five grandchildren, Shawn, Dylan, Ayden, Avery, & Spencer. Patsy Olvera is the unopposed candidate for Lafayette County Recorder of Deeds. She is running for her 7th term. Patsy has worked in the Recorders office for over 30 years. She started as a Deputy Recorder before becoming the Recorder of Deeds. She was elected for her first term as Recorder of Deeds in November, 1982. Patsy is from Lexington and she and her husband, Johnie have 2 daughters, Traci Olvera Peterson and Staci Olvera Schorgl. They have one granddaughter, Taylor. Linda Niendick is the unopposed candidate for the Office of County Clerk. 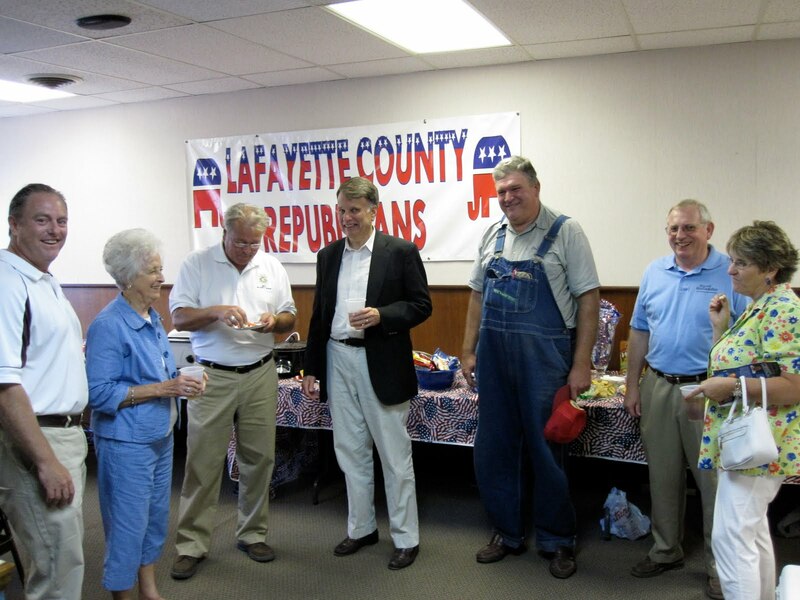 Linda has served the citizens of Lafayette County for the last 12 years. She lives on a farm near Wellington with husband, Neal, and son Benjamin. They also have two grown daughters, Courtney and Abbey. 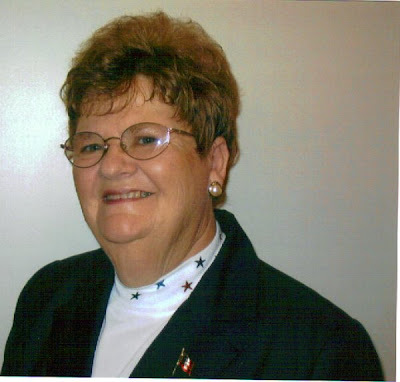 She is seeking re-election as County Clerk of Lafayette County. Deana Aversman is the unopposed candidate for the Office of Circuit Clerk. She is seeking re-election to a fifth term as Circuit Clerk of Lafayette County with twenty-seven (27) years of experience. Deana is married to Dale Aversman and resides north of Corder. They have two daughters, Michelle and Lauren, both students at UMKC. She is a member of Zion Lutheran Church, Santa Fe R-10 Scholarship Foundation and Federated Republican Women's Club. She is also a member of the Missouri Circuit Clerk's Association, Civil Functional Fit Team with OSCA, serving second 3-year term on Court Clerk Education Committee by Supreme Court Appointment as well as various other committees dedicated to clerk education and training, records preservation and improvement to court automation and customer service. To view the full screen version of this YouTube video--click here. Candidates' videos and bios are available on our new web page. Take a look. We hope you'll visit our new web page where we feature videos from candidates, and bios on each of our county, state and national candidates. Click on the menu tab and tour the site where you will find features, such as links to sites we like, volunteer and donate buttons and links to find us on Facebook and Twitter. From Politicmo: "Senate candidates change tones in new ads"
(ST. LOUIS, Mo.) With just 25 days to go in the 2010 elections, both U.S. Senate candidates are launching new television commercials. Carnahan focuses this time on herself, unlike a majority of her previous ads trying to paint Blunt as “the very worst of Washington...Blunt turned the tables on his opponent, and spent twenty seconds of his thirty second spot focusing on Carnahan. “My opponent Robin Carnahan supports the Obama agenda that’s killing jobs, the disastrous stimulus bill that grew government, not jobs, government controlled health care we can’t afford, and a job killing energy tax,” Blunt said. These ads were launched on the same day where it was announced the Democratic Senatorial Committee would be pulling ads out of the Kansas City market. .."
For the full story by Carl Cameron-Fox News, click here. "...Missourians and Americans are deciding in this election.. do we want to live in a country where the government is larger than the people. 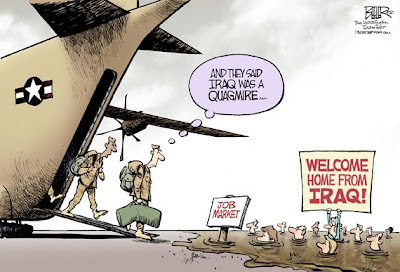 or do we want to live in country where the people are bigger than the country," Blunt said. 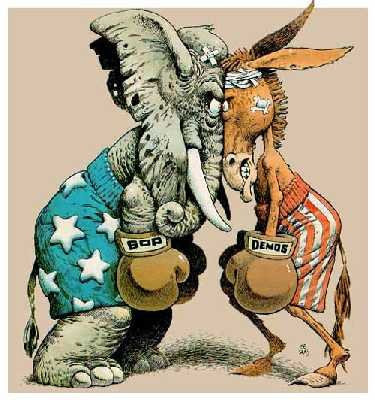 Both candidates are party insiders but this year that cuts more deeply against Dems and Blunt's outside help may make the difference." 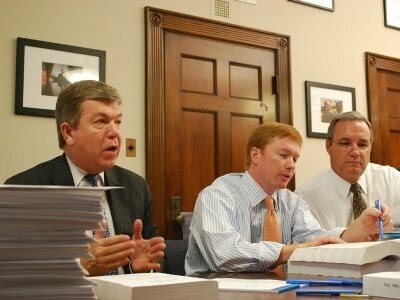 KansasCity.com: "New poll shows Roy Blunt way ahead of Robin Carnahan in Missouri race for U.S. Senate"
"With less than a month to go before Election Day, a new CNN/Time poll shows Republican Roy Blunt leading Democrat Robin Carnahan in Missouri’s Senate race by 53-40 percent. One big reason for Blunt’s lead: He tops Carnahan by 18 points in the Kansas City region, which traditionally has been friendly turf for Democrats..."
Voter Fraud--Missouri is right in the middle of this story, unfortunately. "The Dead Just Keep on Voting"
"...Indeed, if you happen to be in a Democrat-led state (i.e. Sec. of State Robin Carnahan), with major cities and states with a record of vote-fraud – like Missouri, the Obama DOJ will happily dismiss lawsuits where there are actual admitted violations of the law, like the New Black Panther case. 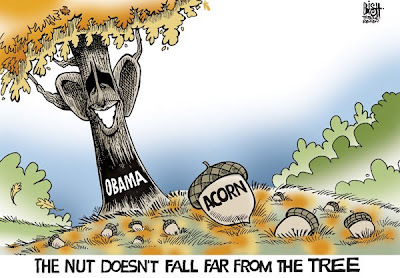 Last year, it accommodated Missouri for failing to purge its voter rolls even though a third of its counties had more registered voters than voting-age residents..."
To read past story with explanations of Obama/Acorn fraud--click here. 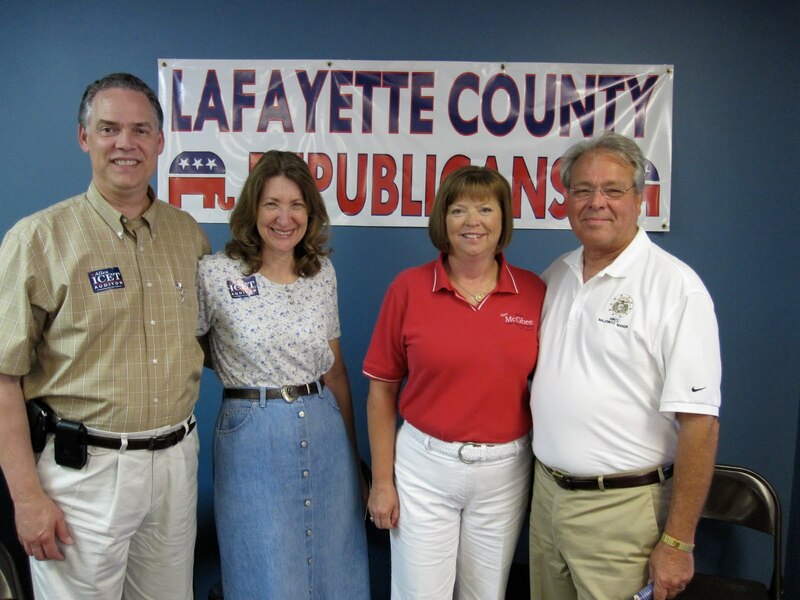 Lafayette County volunteers attend Schweich event in Kansas City. Photo with Tom Schweich & former U.S. Attorney General John Ashcroft. Great event! 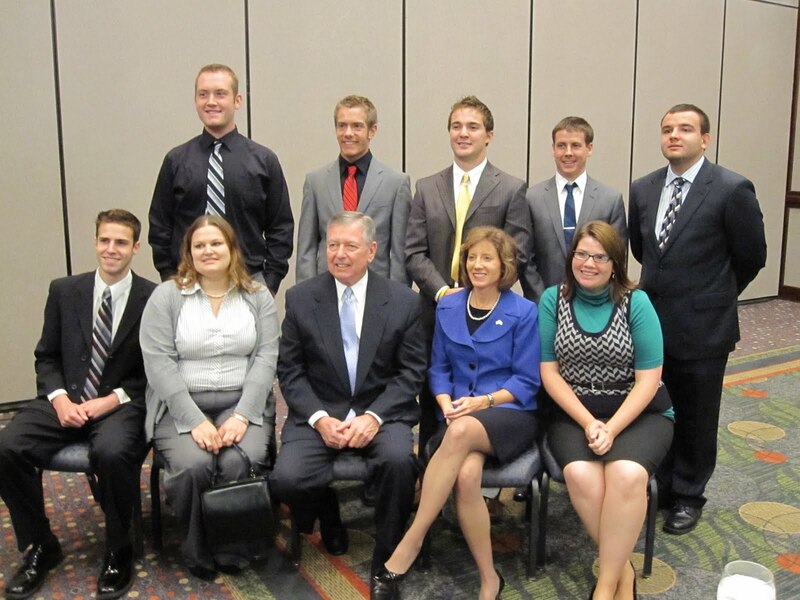 Editor's note: Sorry, inadvertently, not everyone got in this photo, but we had a delegation of eight who attended. 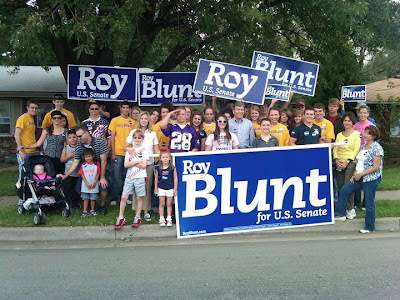 Roy Blunt energized walkers at the Liberty parade as volunteers from 3 counties (Clay, Jackson and Lafayette) joined in the day's festivities. Nancy Pelosi, Harry Reid, Barack Obama and Robin Carnahan are out of touch with Missouri families - you can do something about it by joining the Blunt campaign. Volunteers are the voice of Missouri and of this campaign. Victory is in sight. Help Roy finish the race strong by volunteering here. Next Tuesday's dinner meeting of the Randolph Area Pachyderm Club will feature not one but two of the recognized leaders from the Missouri General Assembly--Senator Bill Stouffer (R-Napton) and Brian Munzlinger (R-Williamstown). Senator Stouffer and Representative Munzlinger have been asked to take the Pachyderm podium and update the audience on agriculture, agribusiness and the controversial Proposition B. That initiative petition, the so-called Puppy Mill Cruelty Prevention Act, caused great angst in this year's session of the General Assembly, consuming many hours of debate, especially in the Senate. Prop B will be on the November ballot. The meeting is open to all interested citizens and reservations are available from Pachyderm seretary Laurel Seeley, at 660-277-4425 or laurels@cvalley.net. Ronald Reagan: "You and I have a rendevous with destiny; we'll preserve for our children this the last best hope of men on earth." You gotta love this story: "New Jersey Gov. Smacks Down Heckler"
Chris Christie tells the heckler: "It's people who raise their voices and yell and scream like you that are dividing this country," he said. "We're here to bring this country together, not divide it." Yahoo News says that the audience roared with cheers and applause, and as a result of the videotaped encounter, Christie's internet fame has soared. September 21st is the first day to vote absentee! Absentee voting ends at 5 PM, Monday, Nov. 1st. Voter ID-All voters must show acceptable identification to the election judges. All previously acceptable forms of identification will be acceptable. Voter Identification Card, Missouri Drivers or Non-Drivers License, Passport, United States Government ID, university, college or technical school ID, current utility bill, bank statement, or paycheck. Avoid Long Lines-As always, voters can help avoid lines at the polls in several ways. *Avoid peak times. These times are: 6:00-8:30 a.m., 11:30 a.m.-1:30 p.m. and 5:00-7:00 p.m.
*Be Prepared. Study the ballots that are printed in the newspapers this week and know how you intend to vote on each candidate and issue prior to entering the polls. We expect record turnouts, so voter preparation is extremely important in this historic election. Connect the Arrows-Our new system now requires that the voter connect the arrows rather than fill in the ovals. The arrows do not need to be blackened, just completely connected. No Straight Ticket Voting-In 2006, the Missouri General Assembly removed from the election laws of the State of Missouri, the option to vote a straight ticket. Voters must complete the arrow beside the name of each candidate they wish to cast a vote for. Voters are not required to vote on every race and issue in order for their ballot to be counted. Every arrow completed will be counted even if some arrows are left unmarked. Absentee Voting- Absentee ballots may be voted in the Office of the County Clerk until 5:00 p.m. The office is open daily from 8:30 a.m. to 4:30 p.m. for absentee voting. Individuals may request absentee ballots by mail by contacting the County Clerks office at 660-259-4315. 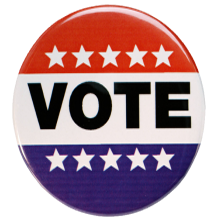 Election Day-The polls will be open from 6:00 a.m. to 7:00 p.m. Please exercise your right to vote. Download and print your request for absentee ballot here. 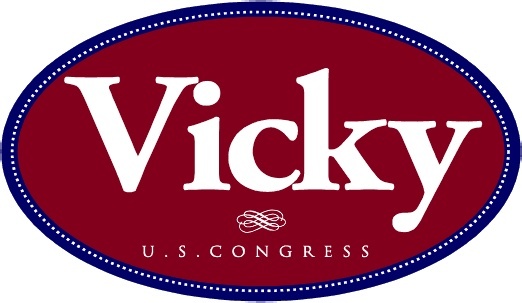 Wondering about Vicky Hartzler for U.S. Congress? Here's your chance to meet her and eat some local BBQ! Monday, September 27th, 5:30 PM, Odessa. Wondering about Vicky Hartzler for U.S. Congress? Here's your chance to meet her and eat some BBQ at the Rocky Ridge Stables just outside Odessa, MO next Monday, September 27th. $10 per person or $30 for your whole family. 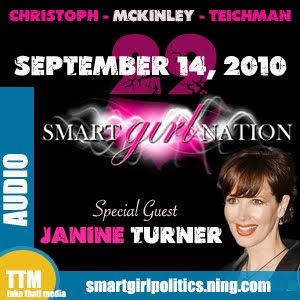 Our own Molly Teichman (co-host of Smart Girl Politics) interviews Actress Janine Turner about the importance of our Constitution--great interview! Lafayette County's Molly Teichman, one of the co-hosts of Smart Girl Politics, talks to actress Janine Turner about her commitment to teaching everyone about our constitution. It's a fantastic conversation that you won't want to miss! You may remember Janine from her performances on the television sitcom "Northern Exposure". Broadcast from TTM (Take That Media) via Smart Girl Politics. 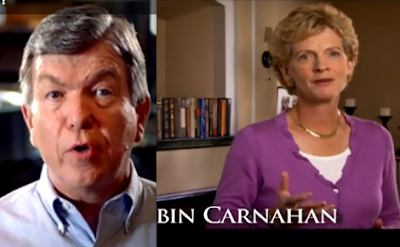 A new poll out today shows Roy Blunt again leading Robin Carnahan by double digits. According to Rasmussen Reports, Roy Blunt leads by 10 points (53%-43%). Read the poll here. 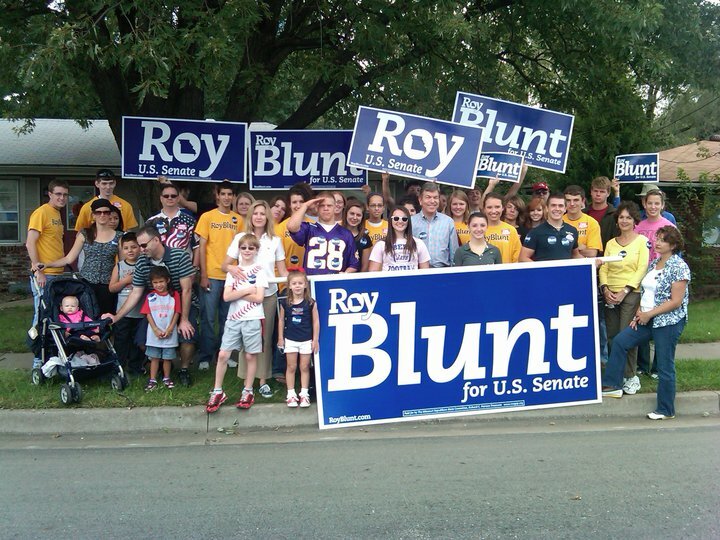 Missourians are responding positively to Roy Blunt's issues-based campaign. He is offering real solutions like his Jobs for Missouri plan to help create private sector jobs for Missourians by lowering taxes, stopping out-of-control spending, cutting red tape and producing more American energy. Robin Carnahan has tried to make this campaign about anything but the issues Missourians care about. In her non-stop, negative false attack ads, Robin Carnahan attempts to hide her extreme liberal positions and her rubberstamp support for the job-killing agenda of Barack Obama, Harry Reid and Nancy Pelosi. Missourians are not being fooled by her attempts to distract from the real issues in this election. Calendar of Events for Lafayette County Until November 2nd, General Election Day! September 9--Central Committee Meeting & Volunteer Training, 7 PM. Headquarters Bldg., 1007 Franklin, Lexington. Speaker: Dan Centinello, Deputy Campaign Manager & Political Director of Roy Blunt Campaign. Highway construction travel advisory: if you are coming from any direction on I-70, do not use Highway 13 at the Higginsville junction to get to Lexington. Highway 13 is closed north of Higginsville and the detour is a difficult one. Instead, take 131 north at the Odessa exit to Wellington and then take 24 Highway east to Lexington. Or if you can get to Highway 24 from any direction, take it straight to Lexington. September 9-11--Concordia Fall Festival. Our booth will be open at 5 PM Friday and 10:30 AM Saturday; parade on Saturday begins at 6:15 PM. September 16--Waverly Apple Jubilee--"Apple Auction", time TBA. September 18--Higginsville Country Fair; parade at 3 PM. We will have a booth from 8 AM to 3 PM. September 18--Waverly Apple Jubilee; parade, 6 PM. September 21--First day to vote absentee. September 23--Federated Republican Women's Meeting, 7 PM, Lafayette Hall, 10th and Franklin, Lexington. Refreshments served. Meeting open to public. 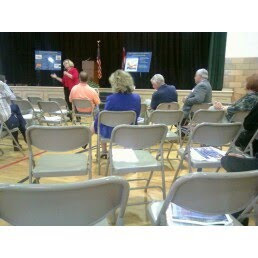 Program: Joe Greeley, political director NW/KC region, Roy Blunt Campaign. October 2-3--Lexington's Apples, Art & Antiques Festival in historic downtown Lexington. Details TBA. October 6--Last day to register to vote. October 7--Central Committee Meeting, 7 PM. Headquarters Bldg., 1007 Franklin, Lexington. October 19--Farm Bureau Candidates Forum, 7 PM, Higginsville American Legion Hall. 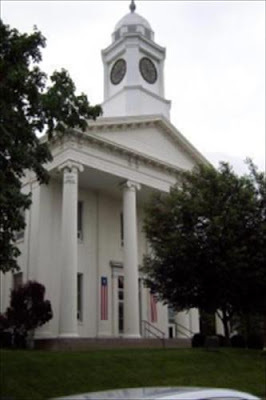 October 28--Federated Republican Women's annual carry-in dinner and Candidates' Forum, 6:30 PM at the Higginsville Community Building in the park. Open to public. 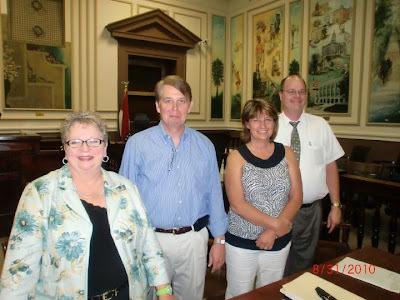 Meet your new 4th Congressional District officers: Penelope Quigg, chair (Cole County); Dean Dohrman, treasurer (Pettis County); Lorri Wykhoff, secretary (Dade County); and Russell Kruse, vice chair (Lafayette County). Repost from Daily Mail Blog: "Prince Charming (Obama) turned out to be a frog!" Ohio Public Policy Polling: Bush 50, Obama 42! 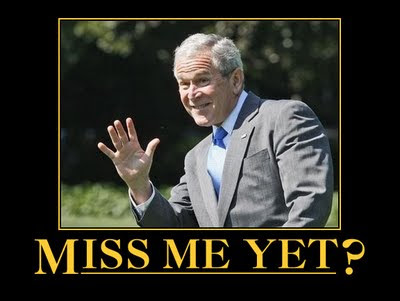 Read the full story from the dailymail.com here: "Voters there say they'd rather have George W. Bush in the White House right now than Barack Obama." Gotta watch this: More Old Spice for Blunt! Watch, Believe, Volunteer! "The ground is beginning to shake, and this isn’t the New Madrid fault finally giving up the ghost. A political year that began with a pro-GOP tinge is looking redder by the day. A “wave” election cycle favoring the Republicans now appears to have the potential to turn into a tsunami. Signs of that possibility continue to proliferate, and they only begin with recent public poll numbers in Missouri’s U.S. Senate race from Rasmussen Reports..."
More from Kraske: .."The much-discussed enthusiasm gap? It’s real. Gallup found that 46 percent of Republicans were “very enthusiastic” about voting this year. Among Democrats, it’s just 23 percent. For months, Democrats have been saying that things were going to get better. To reach Steve Kraske, call 816-234-4312 or send e-mail to skraske@kcstar.com. Just some handy facts to recall during coming weeks as Obama and his congressional Democratic buddies get more desperate to put the blame for their spending policies on Bush and the war in Iraq..."
For another story on this subject, from Randall Hoven in the American Thinker, go here. "Blunt Brigade" ad for interns deemed "Best internship advertisement ever!" Read more at the Washington Examiner. Next time liberals and/or Democrats call you extreme, show them this video. 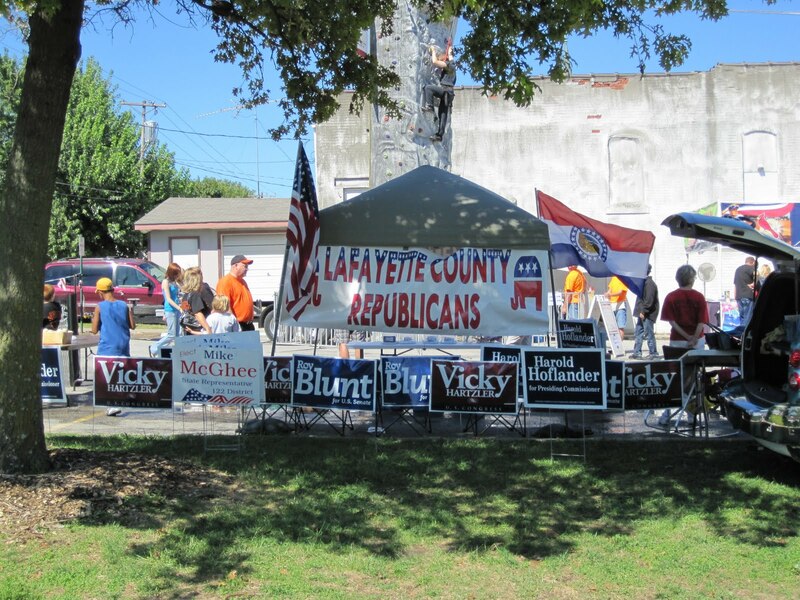 Meet Vicky Hartzler at the Lafayette County Republican Headquarters, 1007 Franklin, Lexington, Mo--tomorrow, Saturday, August 21, at 12:30 PM. Stop by and say hello and then enjoy the parade which begins at 3 PM in Downtown Lexington. An ocean of yellow Roy Blunt shirts (worn by volunteers who lined both sides of the road leading to the Director's Tent), welcomed guests to the Governor's Ham Breakfast at the Missouri State Fair today, August 19th. 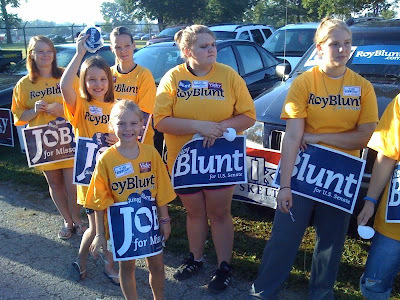 These enthusiastic young ladies handed out Roy Blunt stickers and joined volunteers from around the state who arrived as early as 7 AM to help the Blunt Brigade support Roy Blunt for U.S. Senate. Great crowd, great food, great volunteers! 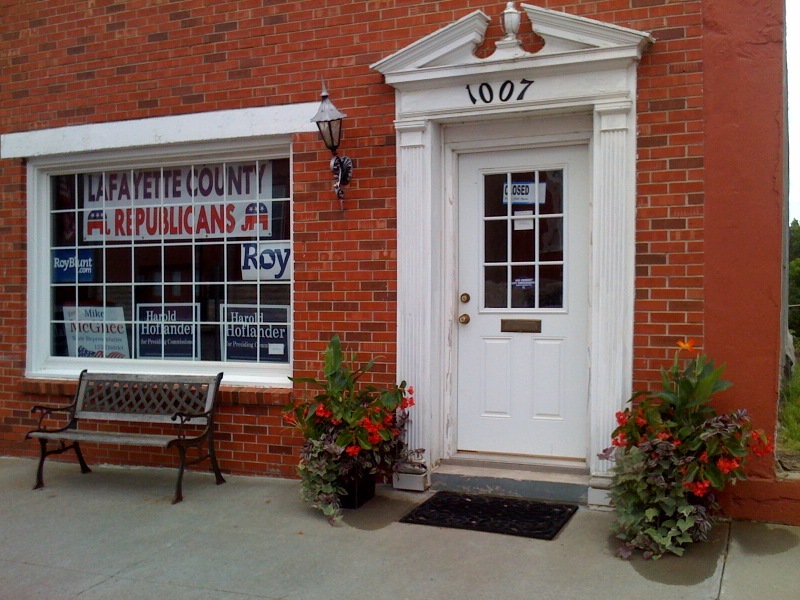 Roy Blunt, candidate for the United States Senate, will stop in Lafayette County this Wednesday, August 18th at 2:30 PM. Stop by Biffle's Barbecue in Concordia and say hello to Roy. For the full story from the Missouri Political News Service, click here. "...The latest NBC News/Wall Street Journal poll again shows more disapprove of President Obama’s job than approve and that a large majority of Americans think the country is on the wrong track. But it’s the president’s approval ratings on key issues that really tell the tale today. In a Gallup release yesterday, of 13 issues the organization polled on recently, it found more disapprove than approve of the President’s handling of 9 of them. And majorities disapprove of how President Obama is handling taxes, health care policy, the economy, the situation in Iraq, the situation in Afghanistan, the federal budget deficit, immigration, and even the environment..."
This is a fascinating and entertaining story by Chris Battle in U.S. News, Politics and Policy, published August 10, 2010. In this article, Battle imagines what a strategy meeting might be like with these Democrat leaders assembled in one room: Obama,Emanuel, Axelrod, Gibbs, Pelosi, Reid, and GM CEO Edward Whitacre. President Obama, White House Chief of Staff Rahm Emanuel, Senior Adviser David Axelrod, Press Secretary Robert Gibbs, Speaker Nancy Pelosi, Senator Majority Leader Harry Reid, and GM CEO Edward Whitacre gather in the Oval Office. Obama in shirtsleeves with his feet up, tie loose. The rest sit stiffly in chairs. There's much, much more. Enjoy this great read by Chris Battle. Chris Battle is a partner at Adfero Group, a public relations firm in Washington, DC. He is also the editor of Security Debrief, a blog focused on homeland and national security issues. Previously, Battle served as chief of staff at U.S. Immigration and Customs Enforcement and director of congressional and public affairs for the U.S. Drug Enforcement Administration. Prior to that, he was a staffer on Capitol Hill, managed political campaigns, and worked as a political and editorial writer at daily newspapers. Claire McCaskill at Concordia Town Hall in Lafayette County: "I noticed the healthcare vote in Missouri and know I may go home over this vote." "At a relatively civil town hall meeting this morning in Concordia, Mo., Sen. Claire McCaskill defended the nation’s new health care law — but said she “noticed” the Proposition C vote in her state and “I know I may go home over this vote. The Odessa parade was the 4th of 9 countywide parades to be held this summer and fall. Lafayette County loves parades! 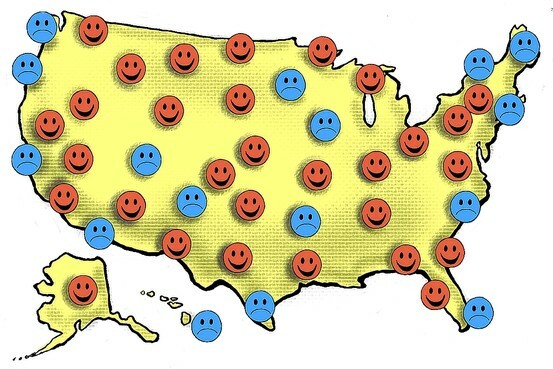 Senior WSJ Editorial Writer Joseph Rago reports on the Missouri results. 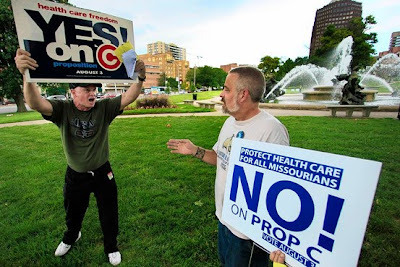 "...Missouri's Proposition C annulled the "individual mandate" within state lines, or the requirement that everyone buy insurance or else pay a tax. Liberals are trying to wave off this embarrassment, but that is hard to do when the split was 71.1% in favor in a state John McCain won by a mere 0.1% margin. 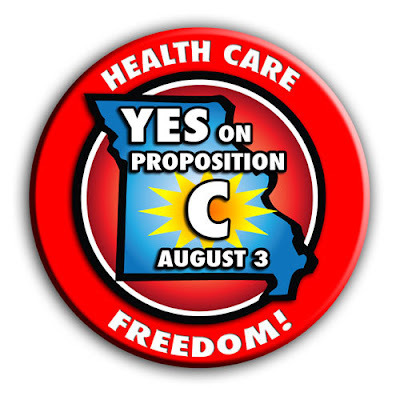 The anti-ObamaCare measure carried every county save St. Louis and Kansas City with 668,000 votes, yet just 578,000 Republicans cast a ballot in the concurrent primaries..."
To view the specific Precinct Reports in the Primary Election , click here. Random Poll Shows Only 5 in 20 even know there is a primary! Know the ballot, read carefully and be sure and VOTE ON AUGUST 3RD IN THE MISSOURI PRIMARY ELECTION! Of 20 Missourians interviewed at random in St. Louis last week, only five knew that there was a primary on Tuesday, much less a referendum on the health care law. Supporters of Proposition C are hoping for a substantial victory that will convey a message of discontent with expansive federal government and rally other states and candidates to press the issue through the fall campaign. To read the full story by Tony Messenger, click here. "...Republicans overwhelmingly said yes to the proposition, 67 percent to 16 percent, with 17 percent undecided. Democrats said no, 48 percent to 27 percent, with 25 percent undecided. The heavy Republican opposition, combined with an expected heavy GOP turnout Aug. 3, leads to the likelihood that Proposition C will pass easily, said pollster Brad Coker, managing director of Mason-Dixon Polling & Research. Even if the proposal passes, legal experts say the question of whether Missourians could really opt out of the federal health insurance mandate will be settled in court. Supporters of Proposition C have pitched it as a referendum on President Barack Obama. And in that regard, poll respondents were clear: They are unhappy with the president..."
Cap and Trade may come back to haunt House Democrats who voted for it months ago. 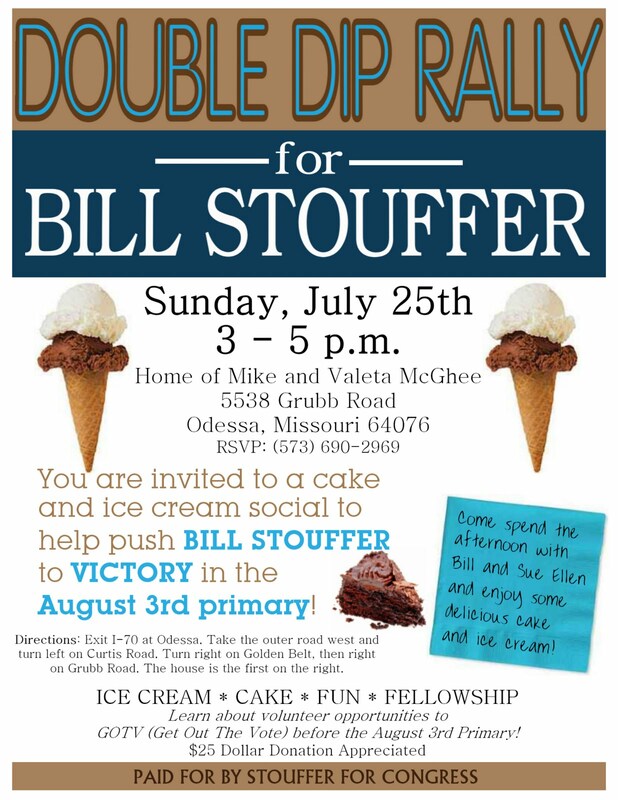 Bill Stouffer, candidate for 4th Congressional seat currently held by Congressman Ike Skelton, comments in this story. "...But 13 months after that tough vote, Boccieri and dozens of other House Democrats along the Rust Belt are not at all happy with the way things have turned out. "That bill would just crucify Missouri. 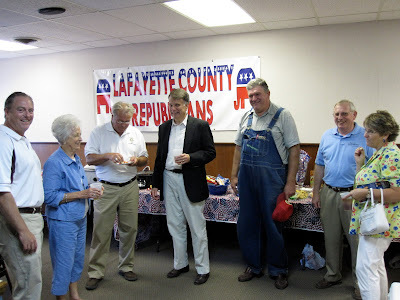 Voting for it, it just didn't make sense," said state Sen. Bill Stouffer, who is one of two well-financed Republican primary candidates hoping to unseat Democratic Rep. Ike Skelton in the fall. The GOP is using the climate change vote to accuse Skelton, now in his 34th year in Congress, of drifting from his moderate Midwestern roots..."
Today the KC Star endorsed Bill Stouffer as "the best of a crowded field" in their recommendations for the August 3rd primary election in Missouri. "The many national challenges — a still-struggling economy, too few jobs, rising health insurance costs, two wars and continued terrorism threats — have attracted a bevy of candidates for Missouri’s congressional races. The retirement of U.S. Sen. Kit Bond creates the most prominent opening. Many of the candidates are new faces. But, when determining the candidates who would best serve Missouri’s interests in Washington D.C., or at least who would provide November voters with the most solid choices, a theme emerged: Experience counts. The best of some very crowded fields know their way around politics. In these complicated times, that matters. For voters heading to the polls on Aug. 3, expect some rather long primary ballots. With that in mind, here are The Star’s recommendations in selected primaries:"
"...State Senator Bill Stouffer of Jefferson City is the best of a crowded field. Stouffer is a fiscal conservative who has realized the importance of spending for economic development, particularly as chairman of Missouri’s Senate Transportation Committee where he proposed widening Interstates 70 and 44. 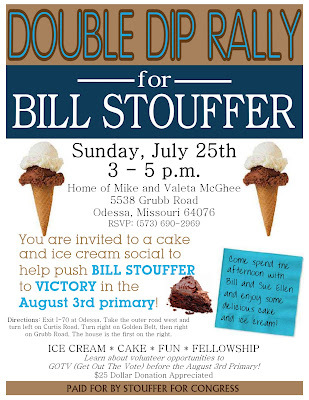 The other candidates are State Sen. Vicky Hartzler, Harrisonville; Brian Clark, Cleveland; Arthur John Madden, Malta Bend; Eric James McElroy, Tunas; Jeff Parnell, Rogersville; Brian Riley, Marshall; James Scholz, Warrensburg; and Roy Viessman, Jefferson City..."
Stouffer for Congress invites you to a "Double Dip Rally" on July 25th! President Obama is coming to Kansas City to rake in cash for Robin Carnahan’s campaign. We need your help to stand up in opposition to big-government and the liberal Obama-Carnahan agenda!! To view site map and for more detailed information, visit this link: Give Me Liberty Rally! 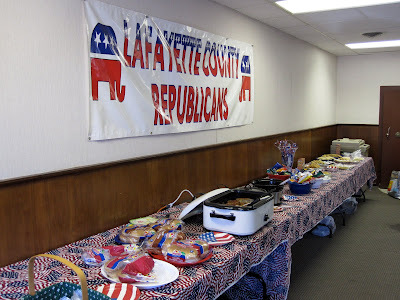 The new 2010 election headquarters for Lafayette County Republicans opened July 1 with a barbecue at 1007 Franklin, Lexington. A large crowd numbering nearly 75 people attended the "drop in and out" open house between 5 and 8 p.m.
Statewide candidate for Auditor, Allen Icet addressed the group briefly, and Rep. Mike McGhee (122nd) offered the table prayer before the group enjoyed barbecue, baked beans and all the trimmings. Other candidates and office holders attending included: Harold Hoflander, candidate for county Presiding Commissioner, Rep. Stanley Cox, candidate for 118th district (which includes a small part of Lafayette County), Brian Riley, candidate for the 4th Congressional District, current and retiring Presiding Commissioner Jim Strodtman, Linda Niendick for County Clerk, Deana Aversman for Circuit Clerk, Patsy Olvera for Recorder, John Frerking for Associate Circuit Judge Division II, Public Administrator Barb Copenhaver, and Cherie Mason for Auditor. Also attending were representatives from the Bill Stouffer for Congress Campaign and from the Roy Blunt for Senate Campaign.